Aquasplash is the biggest water park in the Alpes – Maritimes occupying about 2000 meters, at a walking distance from the Mediterranean beaches. 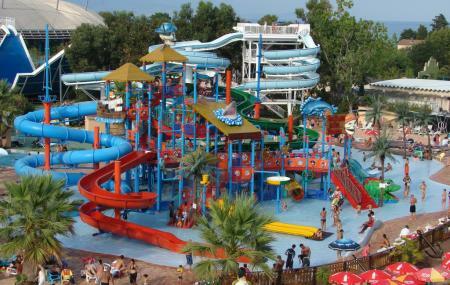 The water park is home to about 22 big slides, Pirates Island, lazy river, Aqua dance, Aqua gym, kids pool, wave pool, kids island, lagoon, obstacle track, magic river and a lot more. If you are looking for an exciting way to beat the heat, the Aquasplash water park is the place to be. Credit cards, cheques, voucher and cash is accepted at the water park. The park is home to restaurants, shops and private parking. You can avail a discount of 10% with the French Rivera pass. People normally club together Musee Matisse and Promenade Des Anglais while planning their visit to Aquasplash. Yes you have to queue but that is to be expected, any amusement park is the same! Get there early and leave late and have a great time of getting soaked and having a great laugh. The rides, if you call them that are great fun, and mid-Summer well needed. You will NOT be disappointed. We went there twice in three days so read into that as you will!!! Enjoy! Very good place, and cheap entry price. 15€ per person (adult or child) if you have a discount coupon. Else it's 23€ or something. You get hold of discount coupons online, or in some grocery stores. Very polite staff showing good service all over the park. A lot of the staff do not speak English, but don't let that stop you. They will either find someone for you, or try their best to communicate with you through pointing and hand gesture. Some strict rules in the watet area but hey!, it's for your own safety! Pulling one star due to only one cafeteria open at the time of visit, and there was a lot of people in the park. Also i personally really hate those almost forced photo shoots they pull you in on when you enter the park. These photos are available for you when you leave, and are NOT cheap! 20€ for 3 pictures or 30€ for 4 pictures pluss 2 key chains. You are not obligated to buy them, but the kids love them and you are almost forced to buy them. The queues are long and the attractions are all stuck in the 90s. But this place is unadulteratedly FUN! Be prepared to wait in line for 30-45 mins for anything though - aside from the wave pool. If you really need a sunbed, I'd recommend booking a VIP tent. I was disappointed. Much smaller than I imagined, especially for the price. Lockers are also very expensive. The toilets after the morning were disgusting & dangerous. Food as always was average & overpriced. The gift shop is tiny with almost nothing worth buying. WARNING there is a no t-shirt policy, I saw people being made to buy swim tops from the shop. Very nice, long and high slides. Problem is the long waiting time because personnel on top of the slides is not accurate and fast enough.